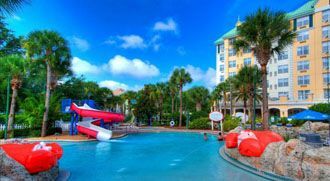 Vacation Packages Orlando.com offers the best Orlando timeshare promotions and Orlando timeshare packages for Disney World and Universal Studios. Choose from discount hotel rates, free hotel stays, local attraction ticket deals and holiday specials for your great family getaway. View your timeshare vacation promotion options now before they're sold out. The time share offers below require a 90-120 minute timeshare meeting. The qualifications must be met in order to participate. Please make sure to read. 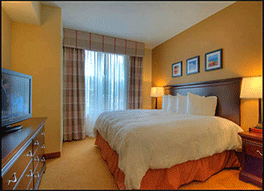 Free hotels stay for three nights is at Holiday Inn Express & Suites South Lake Buena Vista. You will be reimbursed $200 on a Visa or American Express gift card to offset the cost of package at end of presentation. Two free ticket options at Festiva Orlando Resort, Silver Lake Resort and Vacation Villas at Fantasy World Phase Two. For free ticket options, let us know at time of booking that you want to exchange the $200 Visa or American Express gift card for two one day (Disney, Universal Studios, SeaWorld, etc...) tickets to the park of your choice by using the comment box on reservation request form. Silver Lake Resort's supervised programs for the kids will give mom and dad some alone time, while the on-site playground will help your little ones to burn some of their energy. Stay for as low as $99 for three nights after $200 Amex gift card or two free tickets to Disney. Sleeps 6 guests in a 2 bedroom with full kitchen. 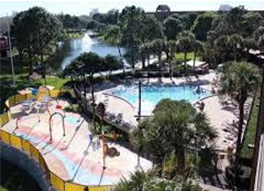 At the Holiday Inn Express & Suites South Lake Buena Vista offers free breakfast, free theme park shuttle free access to Castaway Cove Adventure Park and free on-site parking. Free Stay or $200 Visa. Hotel's location is just a six minute drive Disney. Sleeps 4 guests. Price Range: Free Stay for 3 nights or $200 Visa Gift card from $189. At Calypso Cay Vacation Villas, you will find something to do. A few activities to enjoy are the Castaway Cove Adventure park, miniature golf, nightly poolside festivities, fun splash pad and relaxing picnic areas. Full kitchens, washer dryer in all (1-3 bedroom) units. 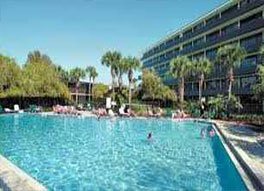 Rosen Inn is conveniently located on International Drive in Orlando, just moments away from Universal Studios, Sea World and Walt Disney World theme parks. Deluxe double rooms ares equipped with flat screen televisions, cable, coffee machines, microwaves, irons, and hair dryers-so convenient you will feel as though you are home! $300 worth of ticket incentives or two free theme park tickets. Located only five minutes from Downtown Disney, the Clarion Inn Lake Buena Vista is also conveniently located near all the Walt Disney World theme parks, including the Magic Kingdom, Epcot, Animal Kingdom, and Universal Studios. $300 worth of ticket incentives or two free theme park tickets. Two bedroom suites have two private bedrooms and baths, a sleeper sofa, a fully equipped kitchen for all your cooking needs, a dining area, and a private balcony. From $189 Per Family for 3 Nights With $200 Amex Gift Card. Spacious kitchens carry full sized refrigerators, stovetops, microwaves, coffee machines, dishwashers, toasters, and dinnerware all the conveniences your family needs for a home away from home with so many additional benefits! Offering laundry facilities, free Wi-Fi and parking, a fitness center, and complimentary breakfast, Stay Sky Suites provides you with all you need for a comfortable stay. Plan and choose to stay in a conveniently located, inviting timeshare resort or relaxing hotel with our vacation packages. 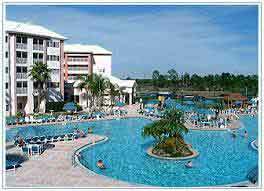 Lodging choices are just minutes away from Orlando's theme parks, major attractions, bargain outlet malls as well as 100's of restaurants. Visit and enjoy the joys and sights of Walt Disney World Resort, Universal Studio's Orlando Resort, Sea World Orlando and more. The entertainment and thrills are nonstop. Explore the marvelous park thrills, challenge a golf course, relax on a nearby beautiful sandy beaches or dine at one of the numerous excellent restaurants. Relax, experience and enjoy Orlando's leisure vacation lifestyle. Inclusive fun and round the clock pleasures await you and your loved ones, at a reasonable price.